"What is your most hated food?" Unfortunately, the most common answer I get in these classes is Brussels sprouts. Far too many of us had a nightmarish experience as kids, probably involving Brussels sprouts boiled into mushy, stinky oblivion. Since then, these much misaligned little cabbages have been forever ingrained in our minds as the most vile, evil vegetable ever. Brussels sprout do not deserve such a bad rap. Far from it. They not only hit the nutritional jackpot, but are also very, very tasty when properly prepared. I can almost hear readers groaning right now. Hear me out, though. The kid cabbage of the vegetable world really does require a second chance. They may look like cabbages in miniature, but their flavor is sweet and nutty and all those tiny little leaves create loads of crispy layers to trap tasty bits. Just like so many other vegetables, the secret is in the preparation. 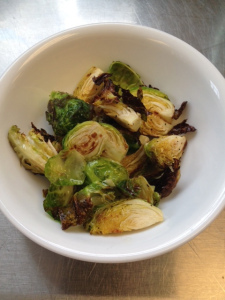 Brussels sprout cookery requires knowing a few choice tips to unlock wonderful flavor. The first is in the actual buying. If you are faced with a bin of these little buggers, take a leap of faith and select the tiniest ones you see. They will not only be more tender, but also sweeter and milder. Once they are in your kitchen, in a pile next to your cutting board, take a little time to trim them. It is a small effort with great payouts. Cut the woody bottom off each sprout, enough so you can remove the 4 outer leaves - arranged like a four leaf clover. Pull these outer leaves away and pitch them. Next, cut the sprouts in halves or quarters, depending on the size of the sprouts. Generally, err on the side of smaller, but try to get all the pieces of sprout to roughly the same size, so they cook evenly in the pan or oven. If you really want to speed up your cooking time, slice the sprouts thinly, like slicing cabbage for coleslaw, perfect for sauting. That's it! Proceed from here with any sprout recipe you like. The simple act of trimming off the bitter, yucky leaves makes a huge difference in terms of reducing toughness and weird chewiness. Cutting the sprouts down to size will also offer up more surface area - which translates to more exterior area where caramelization of the natural sugars will occur. The most delicious flavor profile of Brussels sprouts is their inherent sweetness - but that sweetness won't be released by simply boiling them. The best cooking methods to produce mouth-watering results are sauting or roasting. 6. Taste a sprout! Is it tender inside and deliciously crispy outside? If yes, you are done - if not, return to over for 5-10 more minutes. ***You can also do the same thing in a large saut pan set over high heat. Combine all the ingredients, toss in a hot pan, and stir constantly for about 8-10 minutes, until tender and browned nicely. ***Like many roasted vegetables, this can be served cold or at room temperature the following day. Your lunch box will love you! Maybe at one time you turned your nose up at Brussels sprouts, but armed with some new methods, it is my hope that Brussels sprouts will soon be a cause for excitement. I have converted countless devout sprout-haters over the years, and like so many other experiences, once you try them the right way, you'll never look back!